Neville Lytton, the third Earl of Lytton, trained as an artist in Paris. At the outbreak of war, he volunteered to fight for the Royal Sussex Regiment, taking men from his estates to fight alongside him. By the end of the war, Lytton was the head of war correspondents. He sketched soldiers in the trenches, and painted the scenes he witnessed, his emotions embodied in his paintings. The end of the war saw Lytton working full time as an artist and author due to strained financial circumstances. In 1920 he wrote the book The Press and the General Staff outlining the grim realities of his war experiences as a war correspondent. The last sentence of his book reads: ‘I came to the conclusion that no one but a madman could ever wish for war; the highly polished boots, the bright buttons, the glittering medals and the clicking of spurred heels must never again deceive humanity into thinking that war is anything but the blackest tragedy from start to finish’. The Balcombe Working Men’s Club and Institute opened in 1902. In 1923, it was extended to become the Balcombe Victory Hall, a village social club for men and women and the centre of village life – taking over from the Parish Church. This non-denominational place also became a memorial to the Balcombe men who fought in the First World War and their names are inscribed on a wooden panel inside the vestibule of the Hall. Two hundred men of all classes fought together, died together, returned together, and are remembered together. Lady Gertrude Denman lived in Balcombe and, contributing financially to the Hall, she was heavily involved in planning it. 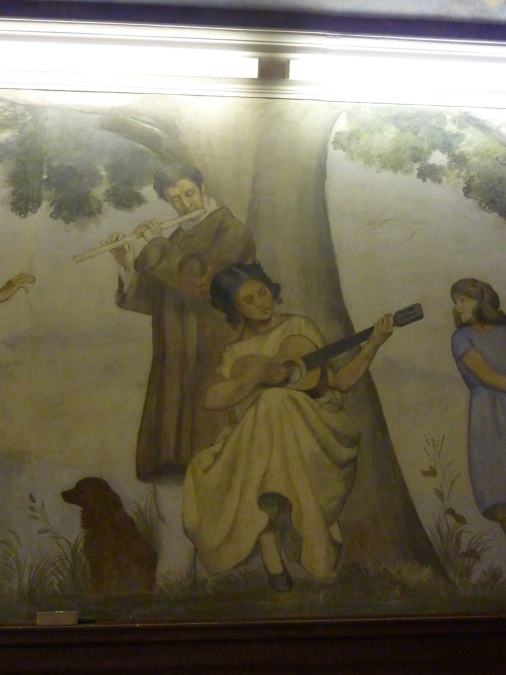 She commissioned Neville Lytton to paint some frescos above the oak panelling around the hall. 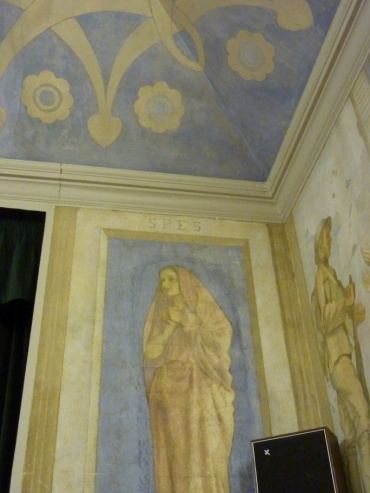 Adopting the traditional Italian fresco technique that had been popular during the Renaissance, Lytton applied paint to wet lime plaster, and, as the paint dried on the plaster, his painting became part of the building. Lytton symbolically incorporated representations of spes and dolor, of hope and sorrow, into his work to impart his message. 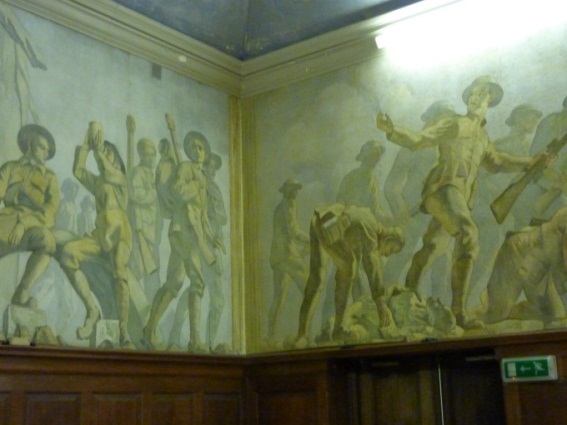 Having first-hand experience of the tragedy and futility of war, Lytton’s frescos not only materialise the gruesome realities of war but also his vision for peace in the post-war era in a more egalitarian society. Neville Lytton served on the Somme and at Amiens and the scenes he painted round the Hall emanate from his own lived experience. A group of soldiers are shown readying themselves for battle. Some men are seated, one man can be seen drinking from a bottle and, as the scene continues round the wall, other men are shown moving forward into battle, the main figure almost nonchalantly carrying a rifle in one hand, beckoning his men to follow him, his open arms ready to bravely embrace battle. Then, a soldier is depicted on the offensive, tentatively feeling his way forward with his feet, not daring to peer down in case he does not see the enemy. He grips his rifle tightly; his body hunched and tensed, eyes wide open, for ever on the alert, listening out for the enemy as his muscles ache from the effort. The next scene portrays soldiers engaging in hand-to-hand combat, the intention to kill, to injure, to survive. They see and touch each other, whereas in the trenches the enemy was an unseen presence. In the next scene, Lytton captures the moment when enemy soldiers surrender, their arms raised high, signalling that they will fight no more. They wonder what will happen next. Then, four stretcher bearers are shown carrying a wounded soldier on a plank of wood to hospital, where, if he does not die, he will be mended and recycled to be returned to fight another day. 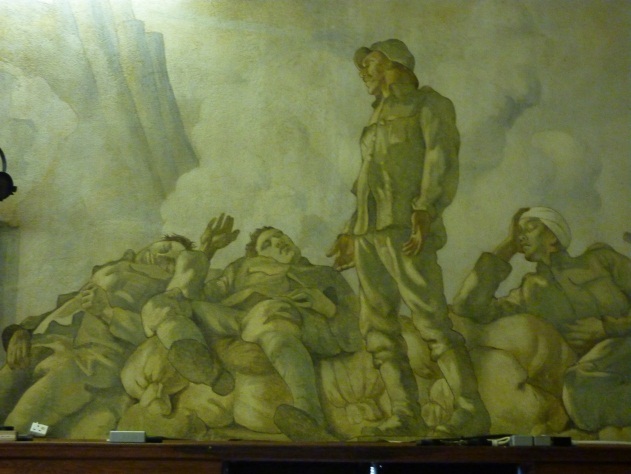 As the mural wraps round the hall, Lytton cleverly brings forth an ever-repeating scenario, clearly transmitting his message as to the futility of war. Many of the people in this panel are recognisable as coming from Balcombe. Lady Denman is shown studying the plans of the hall with her clerk of works and other estate workers. Indeed, Neville Lytton painted himself playing the flute with his soon-to-be second wife, Alexandra Fortel, accompanying him on the guitar – their forthcoming marriage signifying the prospect of a happy future together. A gentleman with a missing limb has survived the war, and, although badly injured, his body altered by war to become an artefact in extremis, he has a future. But he will remember his wartime past for particular smells or sounds may trigger his memory. 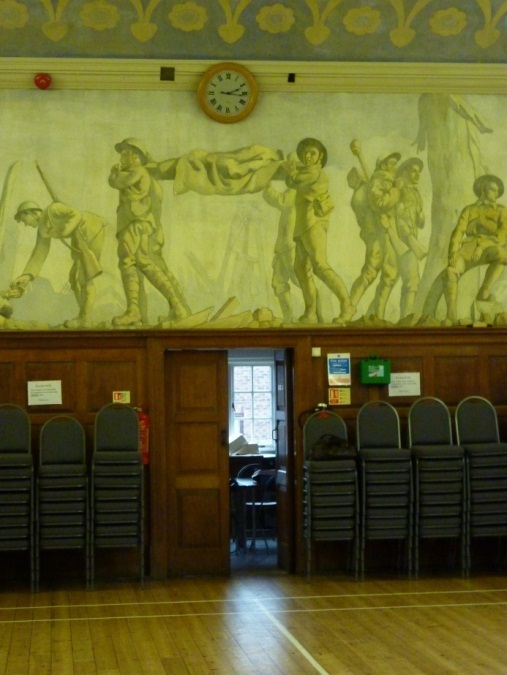 The Victory Hall’s memorial panel provides a permanent record of the Balcombe men who served in the Great War though it is silent as to their experiences. 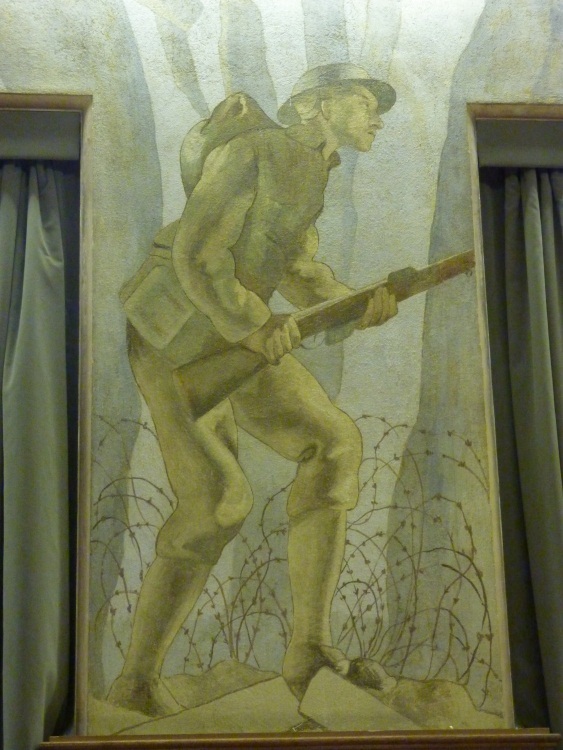 The frescos, on the other hand, the product of an historical moment and Lytton’s lived experience depict the grim realities of the First World War and its apparently futile and never-ending cycle of events, reminding subsequent generations what it is that we are remembering the men listed on the memorial panel for. The frescos and the memorial panel connect past people and events through memory, history and association. 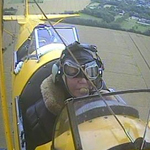 This entry was posted in Material Culture and tagged 070 (News media journalism publishing), 700 (Arts), Blogs, N (Fine Arts), PN4699-5650 (Journalism). Bookmark the permalink. ← What makes a ‘World’ War?